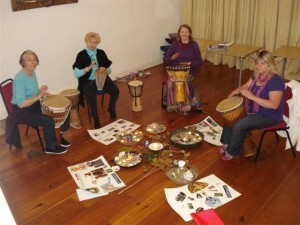 Vision(R) workshops aim to activate all the brain’s centres: sound, image, body awareness, rational and analytic thought. In the process of using two handed Creative Journal, visioning collage, rhythm, music and sound, a natural process of magnetic reinforcement for the intuitive insights into our lives occurs, due to a balancing the right and left hemispheres. Transcript of a talk given at the Gatekeeper Trust’s London Spring Conference 2006. Sound has been used by the ancients in healing and ritual to re-establish physical, mental and emotional balance, as well as contact with the subtle dimensions of consciousness. It is only in the last decade or two that science has openly caught up with ancient wisdom, bringing instruments of measurement to record in an objective way, how our bodies respond to altered states of conscious and holistic medicine, through biochemical changes and brain or heart rhythms. Scientific measurement of brain activity: Since the 1980’s biofeedback machines have been used to record the changes in the skin conductivity, EEG’s record brain rhythm, thermo-imaging scans map the activity of parts of the brain, and heart monitors detect the rhythms of heart beats. Over the last couple of decades more and more research used these monitoring methods together with, meditational and relaxation techniques, in order to measure the response and strength of the immune system for health purposes. The University Hospital of Wisconsin found that antibodies and recovery times were positively influenced by transcendental meditation training for patients. Their heart and pulse rates were lowered, and morale improved, pointing to the psycho-energetic nature of wellness and recovery from illness. The heart-brain: The HeartMath Foundation, specifically uses EEGs and ECGs to measure brain and heart rhythms, with a large body of research that shows the effects of people using certain types of meditation, breath control and visualisation techniques. Their conclusion is that under certain conditions of positive emotion (particularly intuitition, compassion and affection), the heart may be activated into producing rhythmic coherence, which in turn entrains the brain to mimic those rhythms, and the body’s immune system into a stable, strong state (also measurable in terms of its biochemistry). To this extent the heart can be said to have its own ‘brain’ represented by similar neurological (nexuses) and biochemical (neuropeptides) features found in the cerebral brain. Their training programmes aim to support individual stress management, and mental performance through the establishment of emotional coherence. The implications for business, education and personal development are wide ranging, and bring to ordinary life an element of commitment and belief. These new perspectives are rooted in an understanding of our biochemistry, and how to ground our experiences of altered states into coherent and contexualised creative activity. John Diamon using behavioural kinesiology tested audiences’ responses to certain forms of music, and those forms when conducted by different people. Those conductors or composers who had optimistic attitudes influenced their audiences with similar high levels of energy and optimism. Conversely, those who seemed to be labouring under internal stress – for instance Mozart in the stage of his life where he experienced personal grief – brought about low energy responses in their audiences. Exchanging life force through sound: By the same process of muscle testing, John Diamond found that in personal interaction, through using different tones of voice and breath symchronisation, we have different effects on our listeners. Those who he analysed as having a ‘problem focused’ attitude, produced a low response, whereas those who were ‘solution-oriented’ had a therapeutic effect on their listeners. In investigating the energetic correlation to the breath, he realised that life force may be exchanged through the sounds we use in conversation. He devised the term ‘respiratory energy spontaneous pulse’. If when we speak, we use the whole breath, and pause when we need to draw in another breath, the result is that we stay in the flow of the energy that comes with breathing, and both give and receive a constant flow. Thus we may convey a fullness of rhythm and flow of life force to our listener. We are beginning to realise collectively that we are responsible for the rhythm and resonance produced by our actions, and these insights have grown through our understanding of both research and the rhythmic rituals of older cultures. Researcher Andrew Neher et al, at the University of California found that rhythmic drum beats affect ‘many sensory and motor areas of the brain’, because the drum produces a wide range of frequencies and is able to stimulate a greater variety of nerve pathways. Dr Cxaba Szabo of Debrecen University, Hungary, exposed people to a recording of rapid drumbeats and found profound changes in awareness, including distortions of body image, time distortion and feelings of transcendence. Biochemislry of tribal rhythms: It is well known that tribal rhythms have traditionally been used to produce light trance or ‘hypnogogic’ states, which scientists now associate with the release of endorphins, or naturally produced pain killers..
– Listening to music is connected to nitric oxide release found in inner ear function, connecting to lymph and immune system. The role of the expressive arts: Jean Houston (‘The Possible Human’, calls for a return to these older practices, in developing the art of ‘high practice’, or ‘sacred psychology’, or the art of being able to integrate the experiences of a wide range of feelings and sensibilities, including a sense of the ‘ineffable’, into our consciousness development. Thus we tap into the ‘possible human’ within us. We can, she says, move towards states of conscious evolution through accessing our psyche through song, rhythm, dance, poetry, drama and sacred rituals of ceremony and festival. In essence, she believes, we are re wiring the brain and enabling create interaction between the brain’s different functions, a symptom of high creative performance. Rituals using sound and rhythm, positive attitudes of mind, conscious ‘messaging’ to the heart by directing the breath and imagination of positive emotional states, meditation and relaxation, dancing and making merry, all have major implications for health. We are engaged generating positive emotional states of wellbeing and transcendence, we are participating in an ‘evolutionary neurogenesis’, and it is the result of a new break through synthesis of intellect and intuition. Biochemistry of music: Through these and many other discoveries, a new evolutionary pattern for mankind emerging that is understood biochemically, socially and spiritually. Nitric Oxide has been found (Neurosciece Research Institute in New York) to be released in the hearing system by music and sound, causing a sense of relaxation and well being. Nitric Oxide molecules help create the auditory system and are an active agent in cochlear blood flow: cochlear nerve fibres enter the brainstem and are routed through the thalamus to the auditory cortex. It is along this path that the emotion centres within the limbic system are activated when music is played. In an investigation into the nature of hearing the inner ear can be seen to be connected to the immune system, and neurological feedback mechanisms to the brain, ensuring that with the appropriate vocal tones, positive emotions may be generated. Ritual, rhythm and biochemistry: The result of this new understanding of our psycho-biochemistry is that we can envisage how ancient rites and rituals had a sound psycho-neurological effect on our ancestors. We now know that rituals of sound and rhythm play an essential role in enhancing conscious evolution, through the development of our intuitive heart-brain, thus moving us towards greater social and ecological harmony. I believe this understanding can release in us new levels of trust and confidence in our own physical make up and the effect of natural settings on our ability to heal and evolve. As we explore sound in the landscape, allow our ‘heart brain’ to expand, and plunge into confidently into our intuition and senses, the power of many ‘aha’ moments may resonate into new visions of a future of peace and harmony.